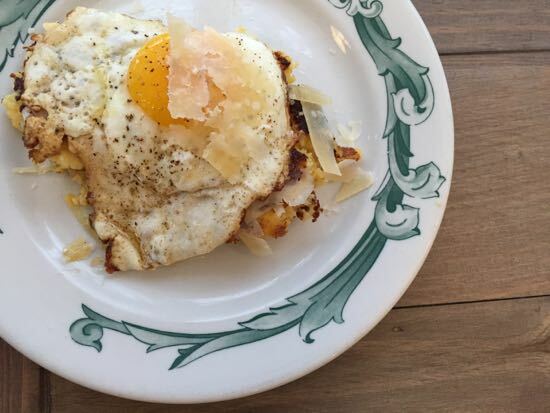 This morning, I was feeling particularly clever as I assembled polenta cakes, a brown butter fried egg and shavings of excellent cheese into a breakfast we needed to face the day. It starts the night before, so serve polenta tonight with your favorite braise. Make extra. Tomorrow, fashion it into griddle cakes. Fry them hard in a hot pan with grapeseed oil. Salt and Pepper. In another pan, brown some butter. Use good butter. I used my homemade butter which browns beautifully. 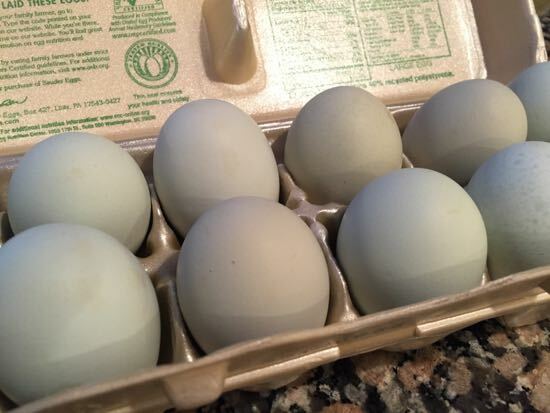 Fry a stunning egg, perhaps a pale green beauty from Painted Hand Farm. Salt and Pepper. Shower it all with a ridiculous amount of Pecorino shaved with a vegetable peeler into long ribbons. Dive in. Think about adding sautéed mushrooms. Or a layer of flash fried pea shoots. Or some of last night’s roast veg. So many possibilities. I’m going to have to make this again. In a 3 quart saucepan or pot, bring the broth to a boil. Taste for salt – it should taste slightly salty. Add up to 1 teaspoon kosher salt. Stream the polenta in slowly, whisking all the while. Continue to whisk until the polenta has become thick and there are no lumps at all. Cover the pot and turn off the heat. Set the timer for 20 minutes. Remove the cover. The polenta will have absorbed all the liquid. Whisk in the creme fraiche. Add salt and pepper to taste. Serve immediately. For griddle cakes, use an ice cream scoop to portion and then damp hands to fashion small round cakes. Heat a cast iron or non-stick pan over medium high heat with a slick of grapeseed oil and heat so that the cake sizzles when it hits the pan. Do not press down or fuss, just let it sizzle for 5 to 6 minutes, then carefully turn and brown the other side for 5 to 6 minutes. Wow, does that sound marvelous for breakfast; would make this in a red hot second for dinner, too! Nice post, Mrs. W! Otherwise known as grit cakes. This is a breakfast staple at out house. Best if cheese and bacon/pancetta is mixed in the grits. I top mine with all kinds of eggs: fried, poached, or most often, a loose, creamy scramble. 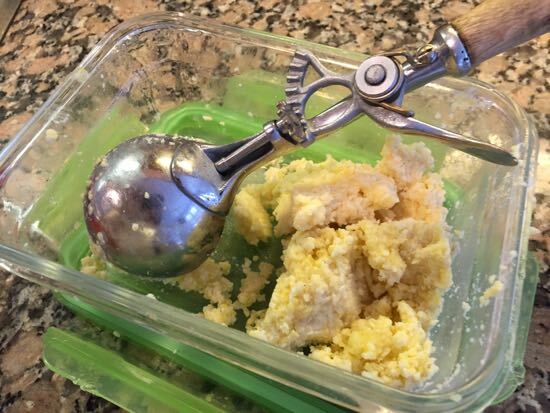 Must try this new-fangled way of making polenta! Fabulous, Cathy! Italian cheese grits! I happened to have left over polenta in my refrigerator, so made this for breakfast today. No pecorino on hand but the polenta had been finished with reggiano. Fried egg in olive oil crispy edged, Spanish-style. Thanks for reminding me how delicious this is. misspelling her own name is what happens when the internet is down and fumblefingers here tries to type on her phone. 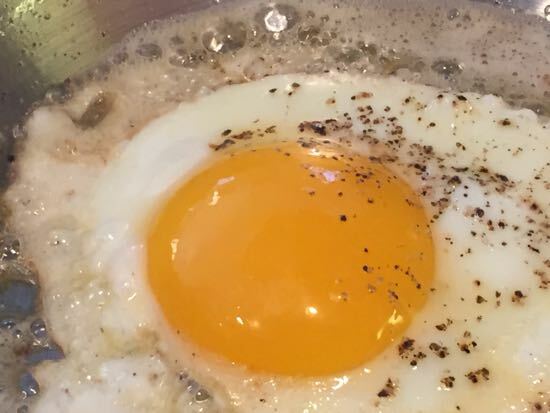 ooooh we love hot grits (i guess they are only faster cooked polenta) with a runny egg on top for breakfast. But who doesn’t love a little fried patty? Will be trying! 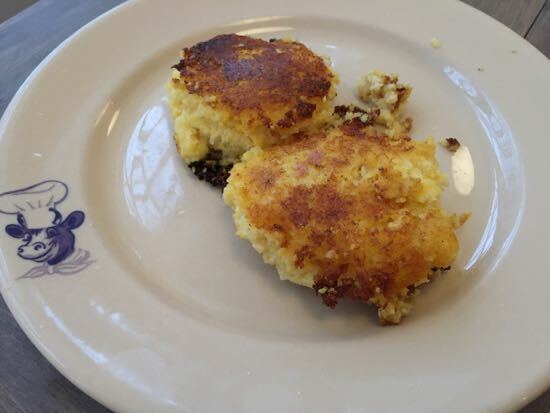 I’m not sure I’d say grits are faster cooked polenta. I cook my grits for at least 30 minutes. But I also use a 4 to 1 ratio of liquid to grits.